Our first set of 5 science papers on results from scooping martian dirt with Curiosity were published this week. Those results and papers seem so old to me; we got the data late in 2012 and wrote the papers last spring. We are working on more papers with more detailed results. This will likely continue for years or maybe even decades - like the Viking analyses. But the specifics are new to everyone not on the team. The excitement from the broader community is so fun to see. Reading the papers and talking about the results (MP3 interview on Insight) brings back interesting memories. Most of them are good. But it was also very hard to identify all of the things that had to be done before we could scoop and analyze the samples. I was intimately involved in that process, and fellow Long Term Planner (LTP), Sanjeev Gupta, captured me working with sol paths and contingencies in one of our daily meetings with the Strategic Uplink Lead (SUL Alicia) and Strategic Science Planner (SSP Greg). Long discussions often lead to better plans. In operations, the LTP, SUL, SSP, and others representing engineering and science instruments meet near the end of every day at the Look Ahead Plan Meeting (LAPM), and often earlier in day at informal tag-ups. 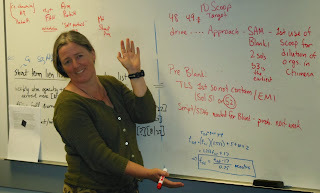 We shape the plans for Curiosity for the upcoming 1-7 sols. This is easy when we are mostly driving, but it was extremely challenging for our first sample. There were so many things we didn't know. We did our best to make good plans and revised them every day until we got our sample and our results. I went through a similar process for Waypoint 1 / Darwin, but in that case, I was the Point of Contact for science planning. Thus, I did a lot of the planning even when I wasn't the LTP. It was great to have a LTP take care of the daily planning while I focused on other details. We'll likely use this approach going forward when we get to a place where we want to do intensive work. It gets easier each time. When I started this mission, I had no idea what it takes to ask a rover on another planet to do science for you. I now have some idea, but every time I sit down with someone with different expertise than mine, I realize how much they know and contribute that I'd never dreamed of. 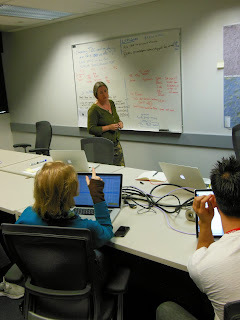 For example, it took strategic planning plus three expert rover planners and me and instrument Payload Uplink Leads plus many others all day to plan the contact science for one day at Darwin. And that is using tools developed that week in response to need identified from our last contact science adventure. And... and... and... Each time we do this, we know more, we improve our approaches, we build better tools. I don't think it will ever be easy, though. We will always push for more; it seems to be in our natures. What an amazing adventure to be exploring Mars with Curiosity! I'm a professor of geology at UCDavis. My blogs consist of a travel log for a project in Antarctica, lecture notes for my sedimentology and stratigraphy related classes, and my experiences on the Mars Curiosity mission. Other online information from me includes sumnerd on YouTube, Twitter, and my home page.